One of my cutie little freshman came to me the other day to confess her recent graffiti spree. 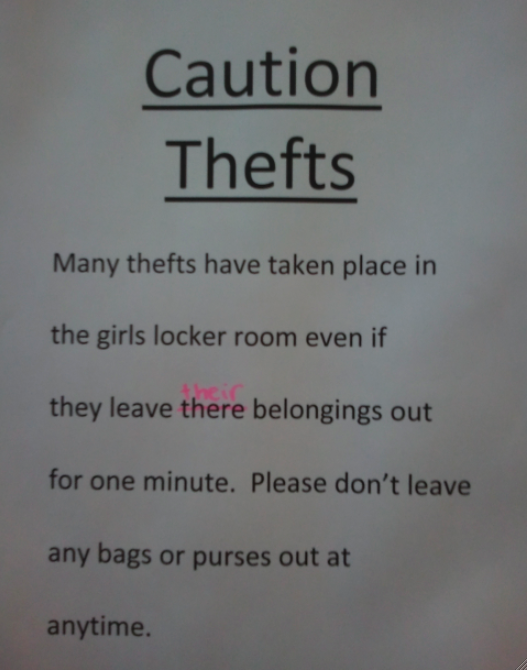 Apparently, there are signs posted all over the locker room warning students about recent thefts and encouraging them to lock up their belongings. She told me that all the signs had a big mistake on them, and that she, with the help of her pink marker, went around and fixed them all. Of course I made her take a picture and send it to me. The there/their issue is really the least of this sign’s problems. According to the sign, even if the thefts only leave their belongings out for a minute, they can be stolen. I can definitely get behind this kind of graffiti.